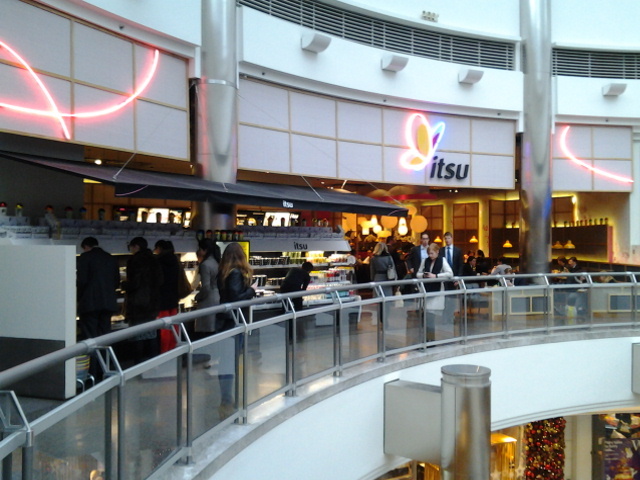 Interesting that it took me so long to blog about Itsu as it is one of my favourite High Street takeaway chains. 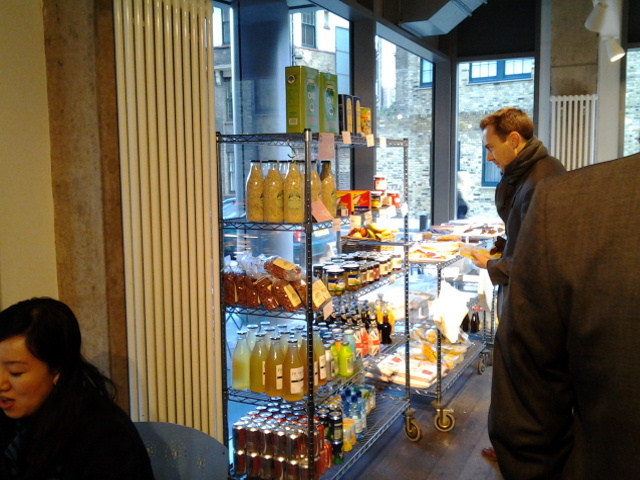 It’s not like the shop is not accessible to me with 4 outlets in Canary Wharf and 1 near Liverpool Street station. There was once when the Vegetable Gyoza udon was one of my favourite lunches. Things fall out of favour I guess. 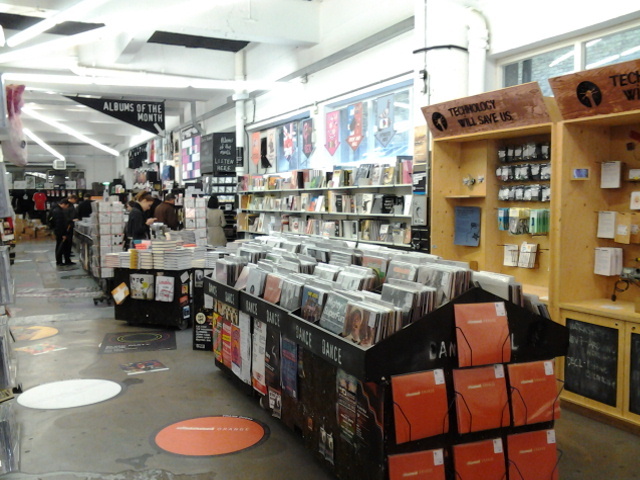 Anyway, being a damp and miserable day, I decided to pay Itsu a much needed visit. I went to the outlet at Cabot Place as it is the closest to me. It is quite a big setup with loads of seats available. 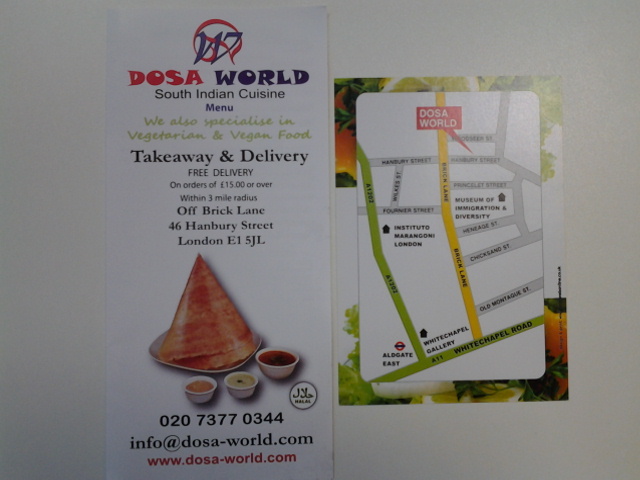 The other outlet in Canary Wharf with seating is located at Jubilee Place while the other 2 dotted along Canada Square are pure takeaway outlets. 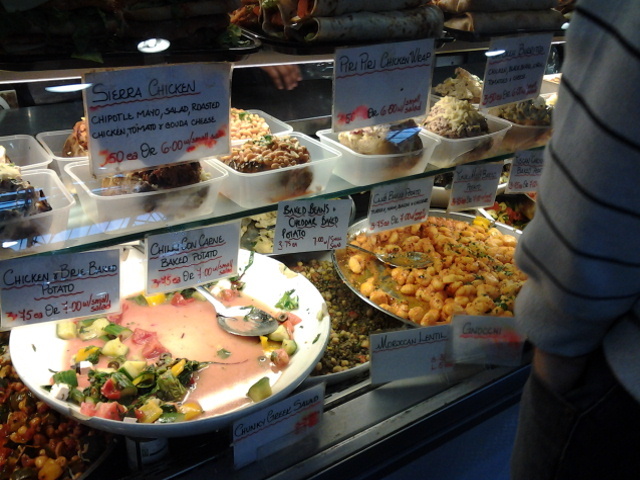 As usual, you can chose amongst the sushi and bento boxes or you can order something hot from the counter. 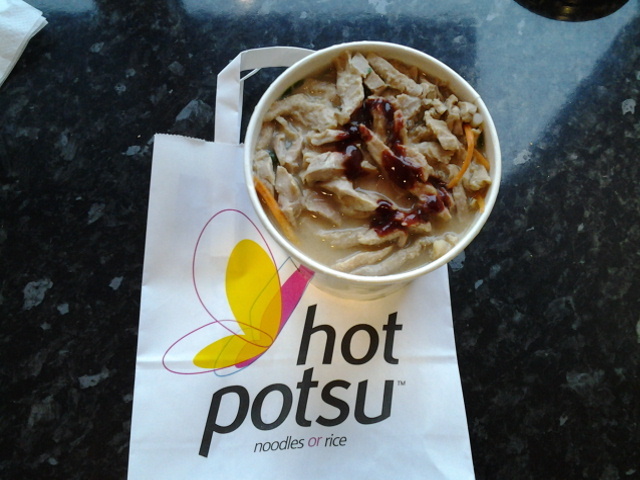 I broke the bank and went for the most expensive option of Roast Duck Potsu Udon at £6.49. Ok, I’m exagerating but £6.49 for a pot of noodles is not to be sniffed at. The sauce you can see on top is hoisin sauce which is quite typically served with duck, especially the crispy duck wraps from all the Chinese takeaway joints. Since it’s roast duck, was expecting some duck skin but none was found. 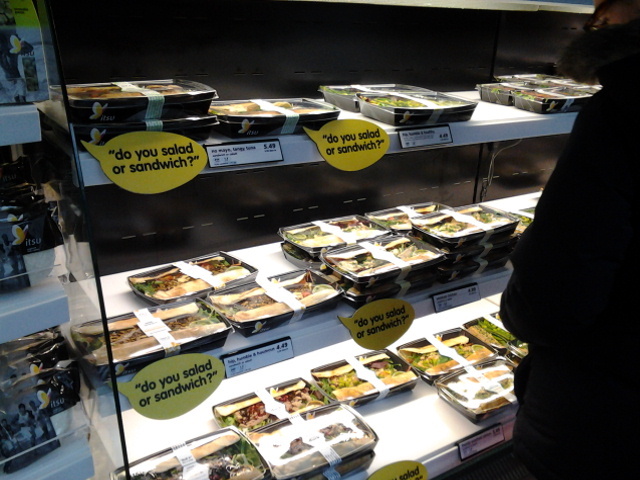 Guess it goes with Itsu’s philosophy of health and happiness sans fat! The broth has a miso base and is loaded with spinach, green beans, mangetout, fresh shitake mushroom slices and other bits of veg. 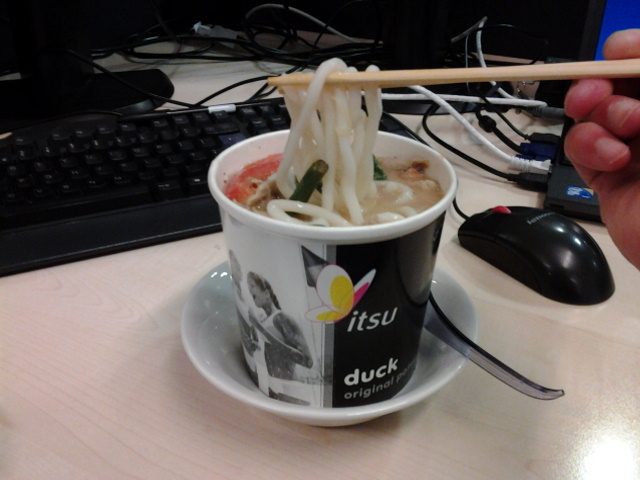 The portion is very generous, there are loads of shredded duck as well as udon. Definitely not one of those noodle soups where they bulk things up with the broth. Well worth the £6.49 I would say. Wonder how the rice version will taste like? You do have the option to either have brown rice or udon with your potsu. The Nigerian told me last week that a few food stalls has popped up in the F block area, one of various spaces in the Old Truman Brewery compound. 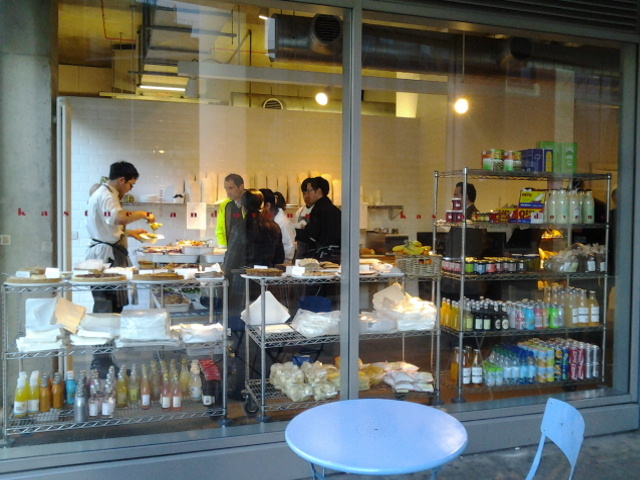 Knowing that these temporary food stalls only operates Thursdays and Fridays, I went to check them out today. 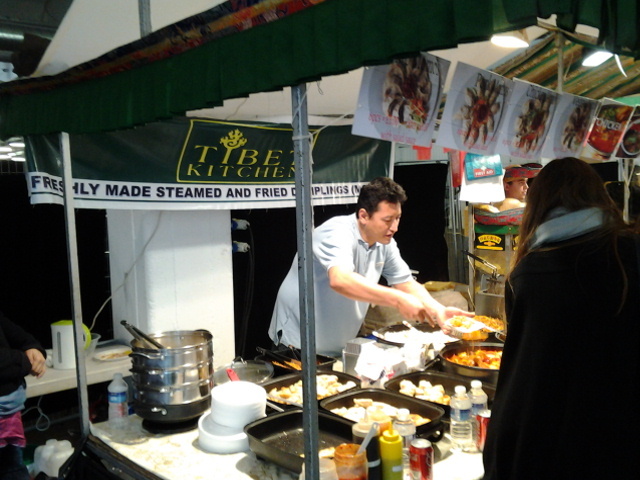 I counted around 6 – 7 food stalls selling food ranging from Asian, Mexican to Mediterranean and Caribbean. I was spoiled for choice and had a brief wobble. Luckily, one word on a stall’s banner caught my eye, Momo. 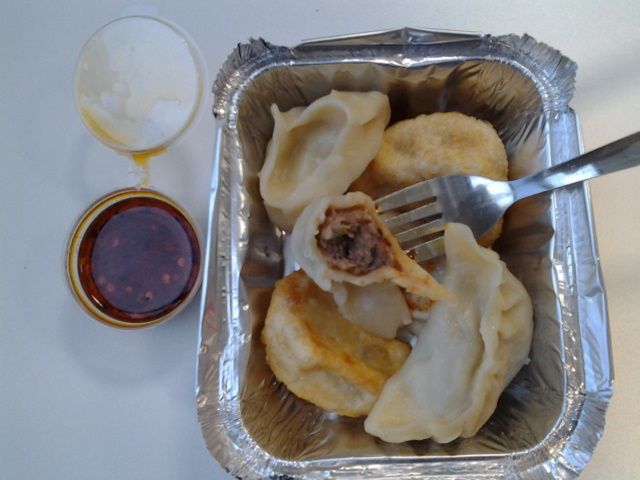 From reading other food blogs, understand that momo is a type of dumpling not unlike gyoza or the dim sum dumplings. Well, they definitely look like the dumplings I know. 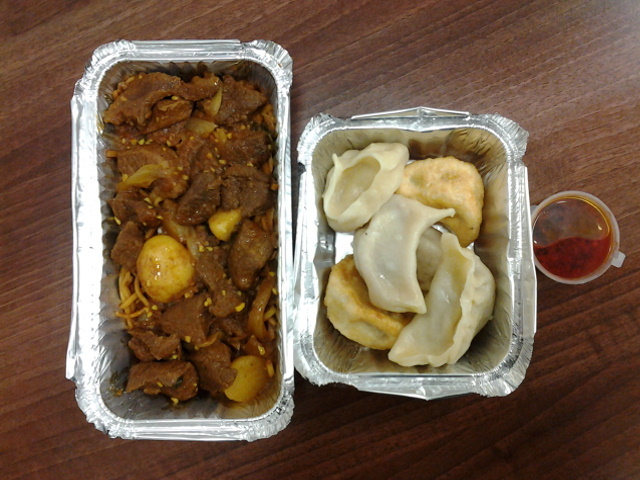 Apart from different types of momo, Tibet Kitchen also offers a few dishes where you can have with either rice or noodles. 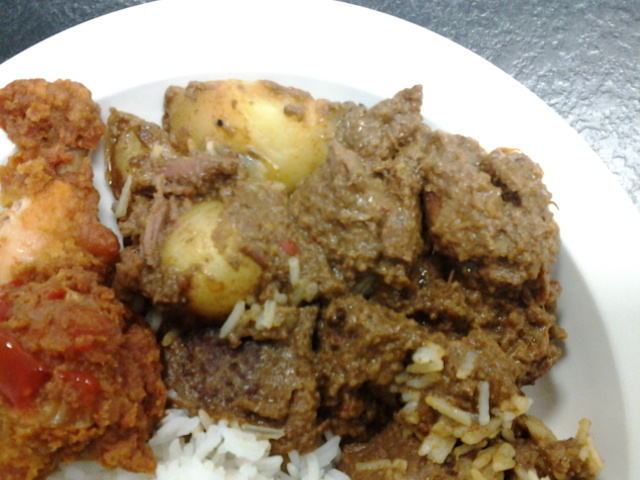 I got a large order of Beef Curry with Noodles which was £6 and only had £4 left (lazy to bring my wallet so just stuffed a £10 note in my pocket). 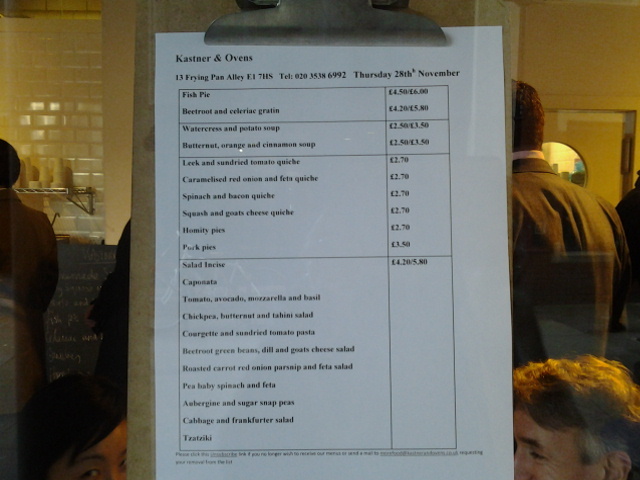 Looking at the menu, 6 momo cost £5 so I humbly asked whether it’s ok for me to get some momo with the £4 I have left. 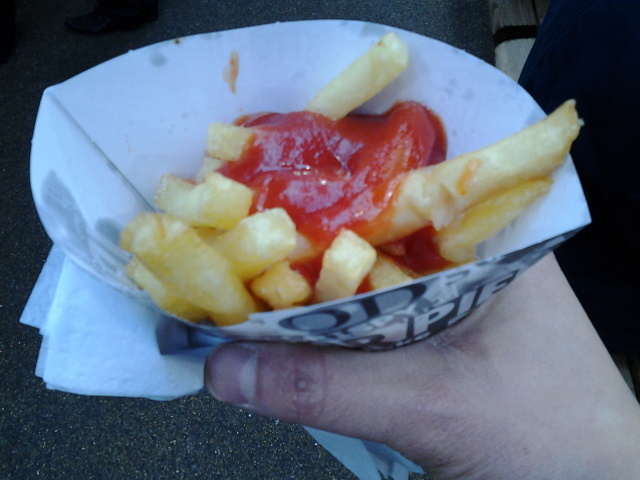 The stall owner gladly complied. I was expecting maybe just 4 momo since I was short. 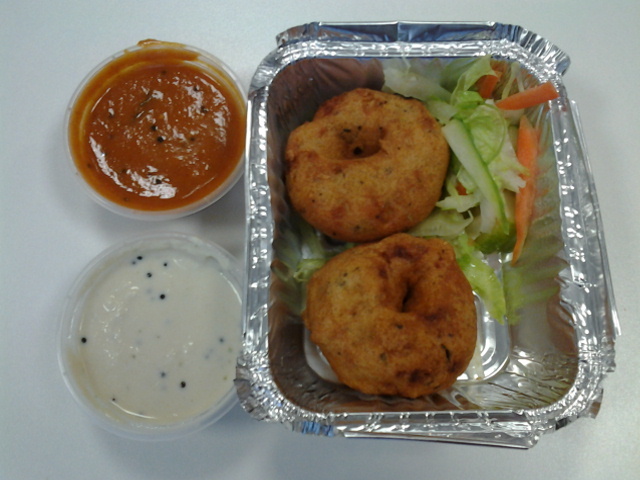 But I got the full 6 and the owner gave me a mixture of both steamed and fried ones. Taste wise, they are alright I guess. Can’t really tell the filling apart by taste. 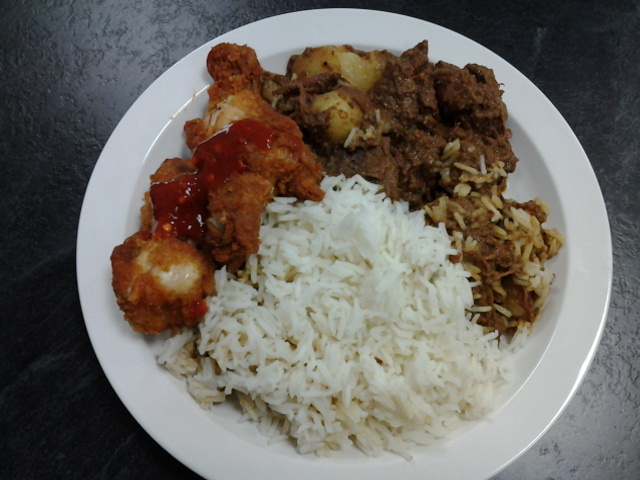 But looking at the colour, I think I got 2 beef, 2 pork and 2 chicken ones. Felt guilty for not having been to the gym all week till today. The idea did cross my mind the past couple of days but with my workload heading towards a car crash, only managed to find some free time today. Threw in my usual 50 laps and did the whole hog by walking back to my office. 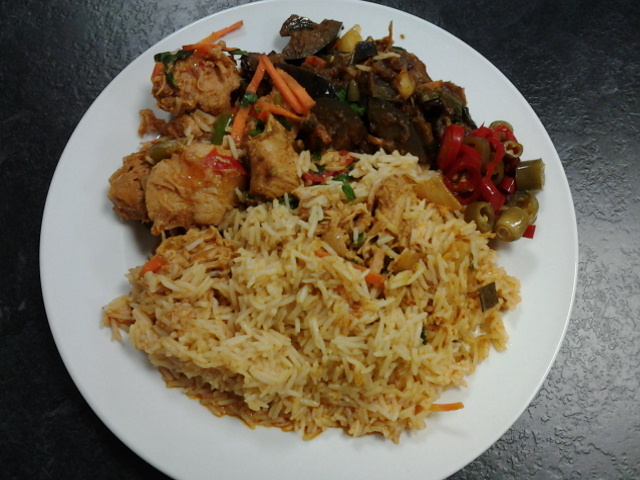 Mama Thai was on the way and so thought why not? 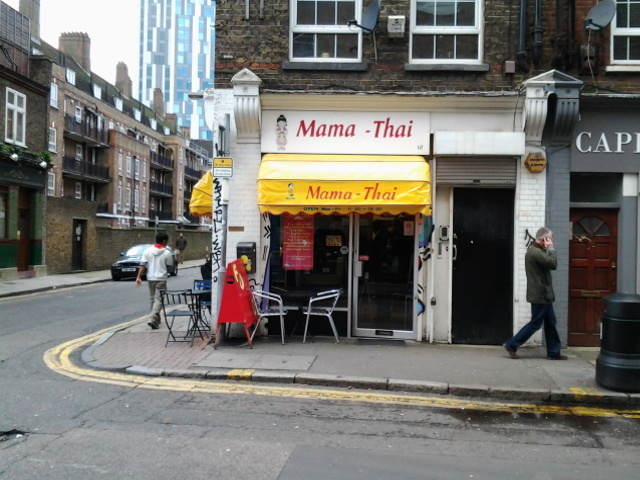 By the time I reached Mama Thai, it was closed to 1pm and geared myself for a long queue. 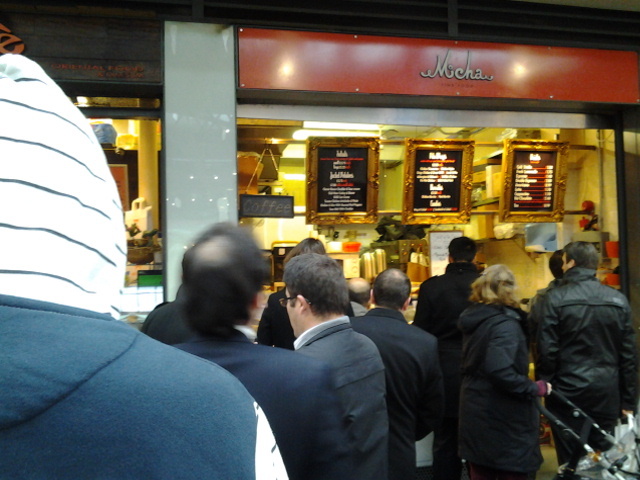 Interestingly, the queue was only 4 deep and I managed to get my order within 5 minutes. 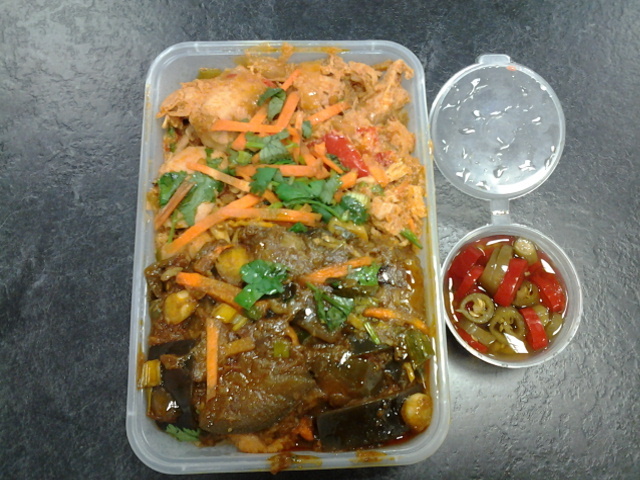 Today’s special dish was Chili Chicken so I got that as well as a side of Spicy Aubergine. 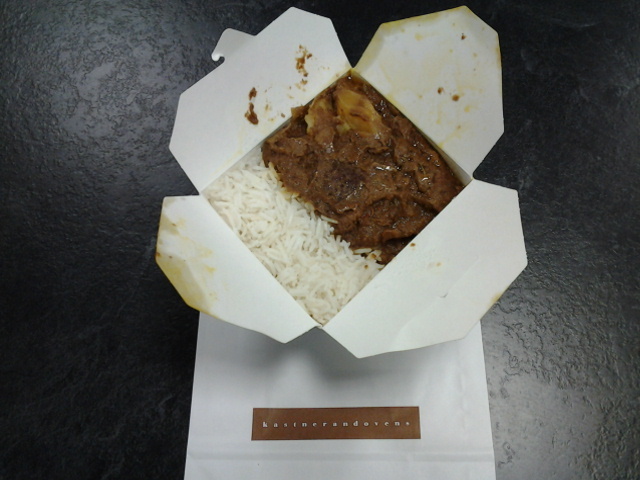 As before, a fully packed box with rice for just £5. 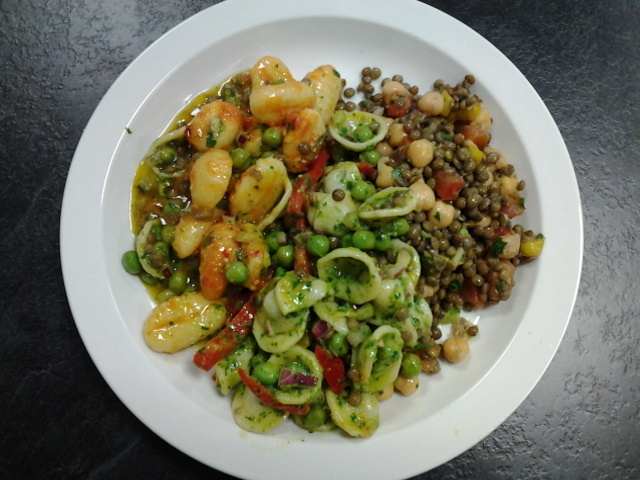 Somehow, did not enjoy today’s lunch as much as I did before. 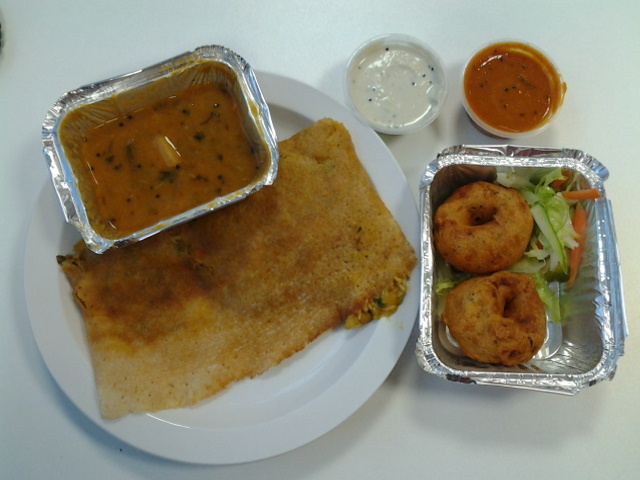 Perhaps it’s cos the Tech Lead came to quiz me about work as I was eating or maybe my mind was occupied trying to get work priorities right. 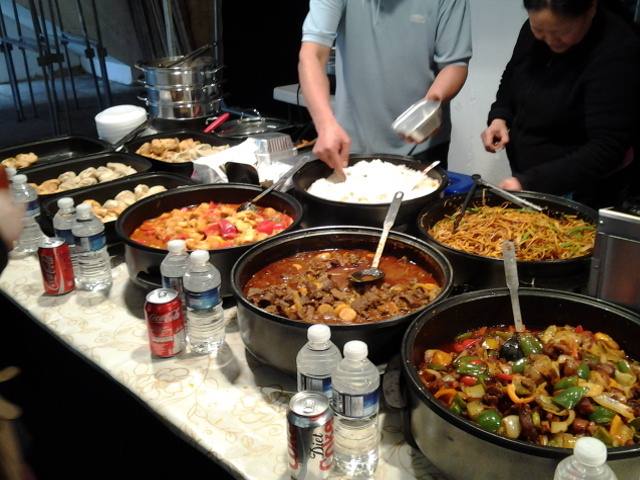 Though the Chili Chicken looked appetizing, taste wise, it was pretty one dimensional. 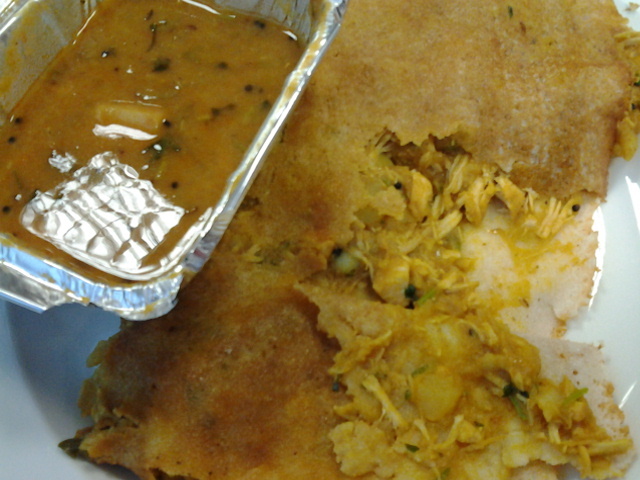 Slightly spicy, moderately seasoned but just plain bland. The aubergine was slightly better with a smoky yet slightly sweet sauce. Lucky I have the container of pickled chilies to help pickup the taste. 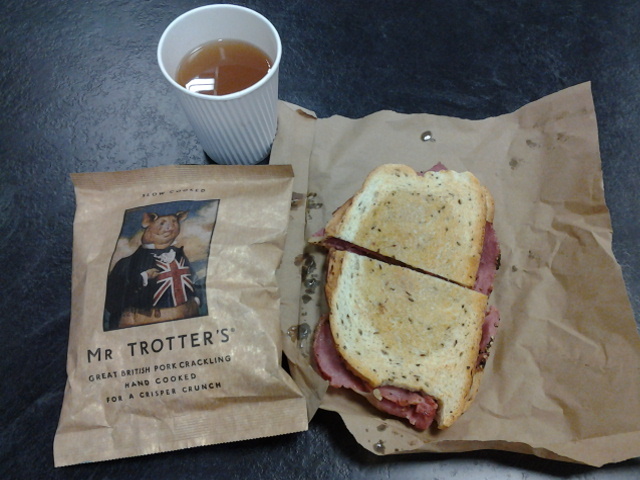 Well, I never expected gourmet and for just £5, one can hardly complain. At least my tum was filled though my taste buds were not. 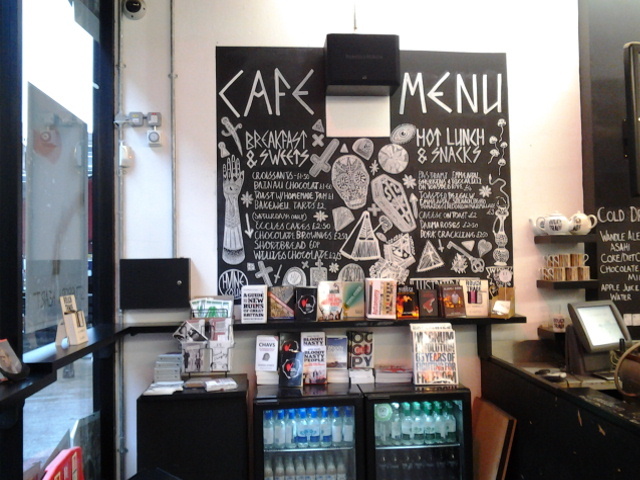 Today’s lunch is from a rather unconventional place, a record shop! 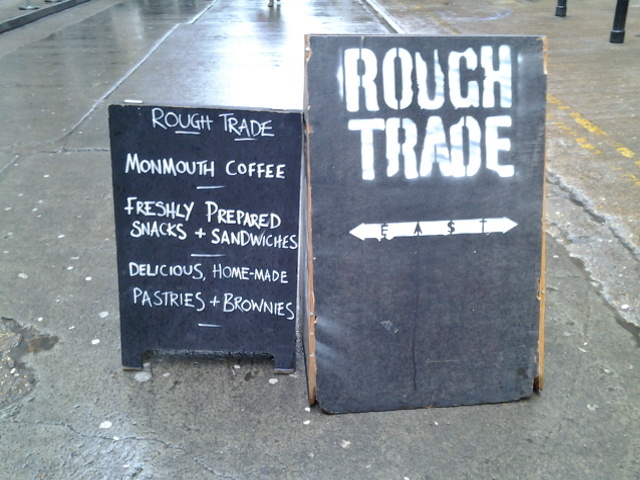 I walk by Rough Trade East almost everyday on my way to work and noticed there in a small cafe in the shop. 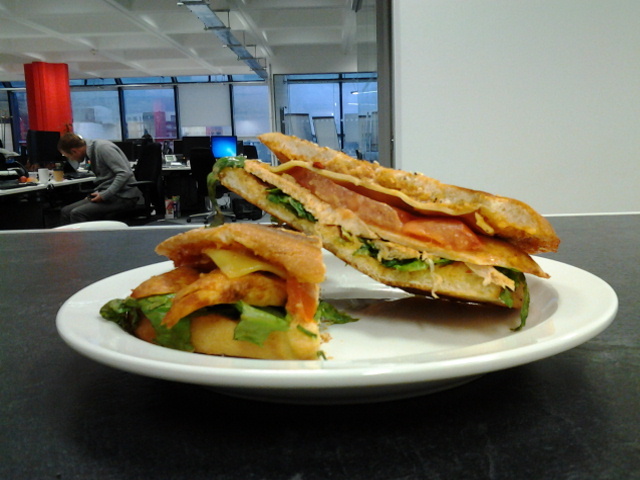 Upon closer inspection, they serve a couple of hot sandwiches for lunch and a specific one caught my eye. The Pastrami on Rye. More specifically according to the menu, it’s pastrami, Emmental, gherkin, piccalilli on toasted rye bread and it’s made to order which ensure it’s freshness. At £4, it’s not bad but they have a lunch special which includes a sandwich, a cup of hot apple juice and a bag of pork crackling for £5. Obviously I went for the offer. 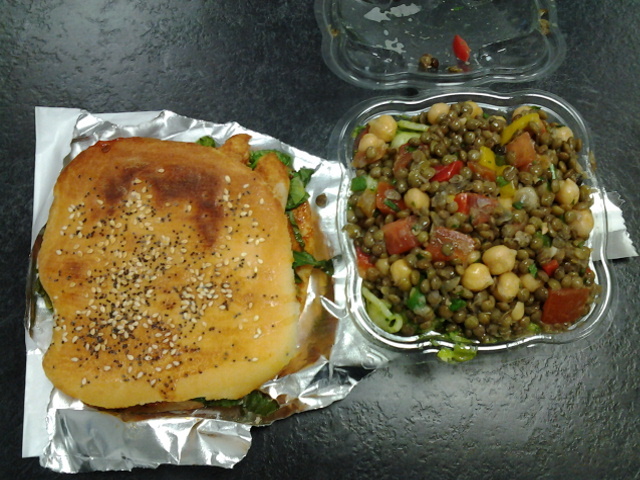 Personally, I think the sandwich was excellent! The pastrami was tender, not too salty and quite generous. 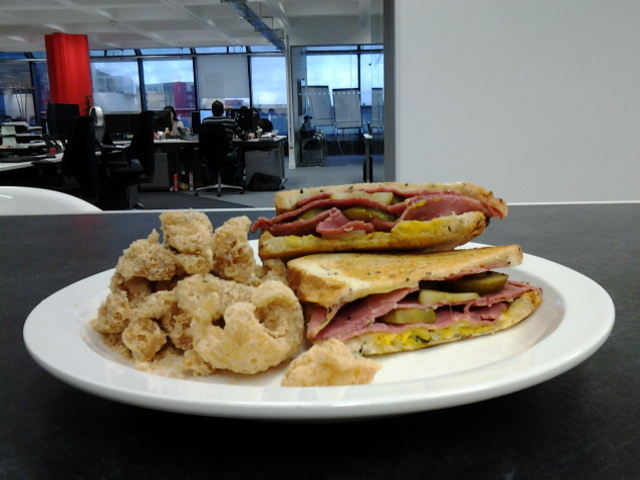 The amount of gherkin and piccalilli did not overpower the pastrami slices and the balance was just right. The toasted rye bread could be thicker (I like my bread thickly sliced) but it was nicely toasted and I simply loved the caraway seeds scattered throughout the bread. Apparently, not all rye bread have caraway seeds, only some does. 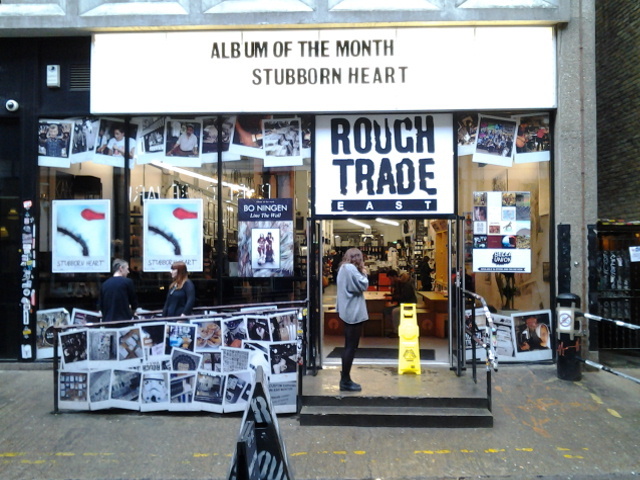 While waiting for my sandwich to be made, I spotted a few other interesting things apart from records in the shop. Will have to pop by one of these days to see whether I can pickup some stocking fillers.